Severe bone loss due to periodontal disease, abscess, or trauma: If bone has already been lost from inflammation, trauma or infection, it is best to immediately graft the site following tooth extraction. It is much easier and cheaper to correct the defect at the time of tooth extraction than reconstructing it later which requires more invasive and expensive procedures. Following extraction of teeth in the upper front area (smile zone): The bone is extremely thin in this area and following tooth loss, the bone almost always shrinks and diminishes in dimension. These results are inadequate bone and gum tissue and poor aesthetic results, no matter what the replacement option. Immediate bone grafting will prevent bone and gum tissue shrinkage and the unsightly defects that results. Bone graft will preserve the bone dimension and gum line creating a natural and cosmetic result following implant replacement. Long-term delay in implant placement: If a tooth has been extracted and there is normal healthy bone, but the patient does not desire implant placement right away for whatever reason, then the site should be grafted if the plan is to place an implant over one year. This is done to preserve the bone and prevent it from shrinking and atrophying, especially after the first year. 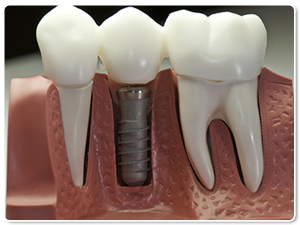 An implant can be easily placed later with predictable results. If not grafted, a defect can result, making it much more difficult and more costly to correct later. Therefore, it is highly recommended for any patient having tooth extraction, to inquire about bone grafting from the surgeons at Piney Point Oral and Maxillofacial Surgery and discuss the plan with the restoring dentist. It will make all the difference during dental implant replacement and the final outcome.